Each course is designed for beginners, however for experienced operators or ex licence holders, assessors understand your time previously on the Elevated Work Platform machine. Therefore the course approach is understanding what is required under the state law for obtaining your licence again. New rules and regulations from Workplace Health and Safety have stated the assessor must follow these new guidelines. 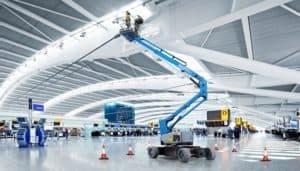 This course is structured that you will be operating a knuckle or boom lift elevated work platform from one point to another, you will mobile (if machine type is applicable) to gain access to roof tops. operate to full extent of the machines height range, understanding substrate stability, emergency decent, use ground controls and pre-starts (basic servicing) to name a few. These machines are designed to operate inside warehouses (see pic above), industrial workplaces and construction sites, therefore your course training will always reflect a simulated live work site so you are able to obtain the skills required for real life scenarios. Course requires students to sit 1 day of theory in the classroom and 1 day for the practical component of the course. You are required on the 3rd day for your assessment. Legislation | planning | calculations | correct safe operating procedures | hazard identification and implementation of controls to reduce the risk of injury | pre start of machine (identifying EWP parts to service) | shutdown of machine (understanding correct procedures) and knowledge of site clean ups. Written assessments in English only and provisions from the Australian Government at this stage does not extend to translating devices. Accredited Trainers and Assessors must by law notify via an online written notification system for each assessment to be conducted to Workplace Health and Safety QLD or known as Work Cover in NSW. Weekends and public holidays excluded. Light manual handling / must not have a fear of heights! Recognition of Prior Learning is usually associated with qualifications containing numerous units in the course to be completed and where the student has completed elsewhere the required units and pays a fee to credit transfer. However this course is unavailable to RPL due to the nature of the assessment rules and regulations in High Risk Work licensing. If you can find it within your licence class, you can operate it nationally. They will either conduct their own VOC by their own workplace trainers or externally source trainers from companies such as ourselves. The downside for the worker is without having a nationally recognised licence when employment ceases you can no longer use the certificate to operate outside the mine site. In recent years, employment agencies require (before issuing your mine site employment contract) formal training prior and be able to provide evidence of your licence. Please note; The requirement of a VOC to be conducted may vary from site to site and may determine the available machine types,size, brands being operated, current licences and or industry experience. When training with us, legislation requires ALL assessors to formally identify a student on enrolment. AS1 – Assessment Summary Form (on course completion) This is your sign off form the accredited assessor.